We have seen moose on nearly all of these tours for more than 15 years now, an incredible success. Not even the locals seems to believe this. Come and see for yourself. We meet up in the early evening, and then travel in our minivan to one of best area in Sweden for watching moose. Here we sit down by a fireplace with a beautiful view over a still and pristine lake. We are now deep in the taiga, a forest where wild animals like Moose, Roedeer, Wild boar, Hares, Foxes, Badgers, Wolves and even Lynxes roam free. We often see birds like Golden Eye, Crane and Heron. Before we eat we wanna go for a hike to explore the surroundings. The forest here is unusually wild, the ground is completely covered by moss in all shades of green and scattered by berry bushes. During our walk our guide will take short breaks to share knowledge about moose and any other tracks and signs that we may come across. When we return to the lake we will light a campfire and have an evening meal together. We typically eat smoked lamb wrapped up in flat bread with organically grown vegetables. Flush it down with a glass of berry juice or a bottle of beer crafted by our local brewery. There'll be organic coffee, tea and Amy's chocolate cookies for desert too… yummy! Later in the evening we will take our minivan and drive through the forest in search of Moose and other wildlife. Keep in mind that Moose are shy animals. We don't feed them and they don't seem to get used to people. We aim to find them in their natural habitat. And we always do! We aim to observe the animals from a respectful distance from the van, and whenever we get the chance, we step out to get a bit closer and to increase the chances for better photos. After dark we conclude the tour and drive back to Kolarbyn Ecolodge. 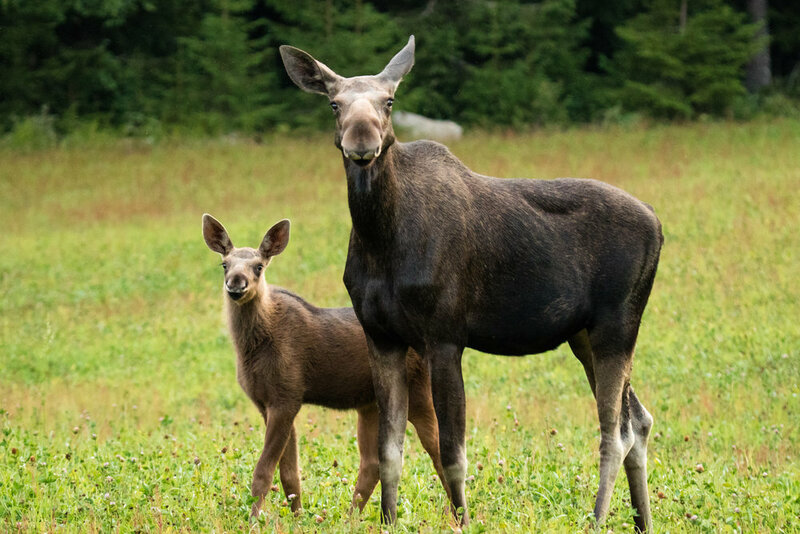 Hopefully you will return home with a better understanding and greater respect for Moose and the other wildlife that you have seen during this evening. May - September is usually good for Moose watching. May means moose feed in open areas which gives us lots of sightings. June and July have the best light conditions for photography. August and all of September is when the bulls have grown out antlers and we often see more Moose bulls during this time because of the approaching rutting season. September is an interesting time and we still see moose, but note that we see most of them when it is too dark to take proper photos. We are usually out for 5 hours in the evening. The starting and ending time depends on the season, see calendar. Make sure you are on time as we are leaving shortly after the meeting time. Recommended minimum age is 8 years as we often stay out until late in the evening, especially during May - July. Participants should be able to walk in the forest without difficulties. Walking level is easy to medium. We walk in the forest off-trails at a slow pace with many stops along the way. If you can’t make the walk you can wait by the campfire and still join the drive to see moose. There will be max 7 persons with one guide. With two guides there may be up to 14 participants in two groups. Meet our guide at Kolarbyn Ecolodge, a 5 minute drive from Skinnskatteberg or a 2 hours drive from Stockholm. It is also easy to get here by public transport. WGS 84: N 59° 48' 30.32", E 15° 43' 37.64"
Book and pay online at this page. You will receive an instant confirmation by email. All departures are guaranteed.